Affiliations: Black Tiger, Crime-Buster, Bob Diamond, "Joseph Duffy" (assumed identity of Gerry Kammill), Professor Gamble, Hawkeye (Clint Barton), Iron Fist (Daniel Rand), Misty Knight, Power Man (Luke Cage), Rafael Scarfe, Jennie Royce, Thunderbolt (William Carver), Colleen Wing, D.W. Wright, Harmony Young, Muhammed Zebari. 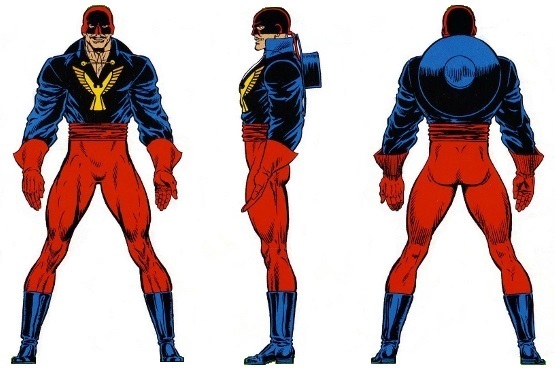 Powers/Abilities: El Aguila had the mutant ability to generate and channel powerful (bio)electric charges that emanated from his central nervous system. His body was able to discharge a maximum of 100,000 volts, sufficiently powerful to kill an adult man or stun a rhinoceros. Aguila could only unleash this power through a conductive medium. He favored a metal blade to discharge energy, with his blasts covering a maximum range of 30 feet. Aguila was able to mentally control the potency of his electric blasts, reducing its potency so the blasts would simply stun or incapacitate. El Aguila's body would naturally discharge any excess energy in minute, harmless quantities. After exhausting his bioelectricity stores, it took him 30 minutes to recharge back to full strength. To downplay the fact he was a mutant, Aguila tried to make people believe he merely wielded a blade outfitted with an electric blaster. Without his mutant abilities, he has all the strength of a man his age, height and build who engages in intensive regular exercise. He is a master swordsman and an excellent hand-to-hand combatant. His favored sword is a 36 inches long double edged blade with a handguard that curves around the knuckles. The weapon weighs 2.5 pounds. (Marvel Westerns: Outlaw Files I#1 (fb) - BTS) - In the mid to late 1800s, Paco Montoya became the latest Spanish hero el Aguila, a line tracing back over a millennium to the Aztec hero Cuauhtli. Paco was, in turn, succeeded by a number of other Aguilas. (Official Handbook of the Marvel Universe I#1: Aguila entry) - Alejandro was born in Madrid. (Marvel Comics Presents I#9 (fb) - BTS) - Alejandro's parents -- who knew they were doing something dangerous -- gave their lives willingly so Alejandro could live. Alejandro blamed himself for their deaths. (Marvel Comics Presents I#9 (fb) - BTS) - Alejandro grew up as a street urchin in the small village of San Elainya, begging for food and living only by the kindness of strangers. (Marvel Comics Presents I#9 (fb) - BTS) <20 years before the main story> - Alejandro moved to the USA, where he became a self-made millionaire. (Marvel Westerns: Outlaw Files I#1 (fb) - BTS) - In recent years, Diego worked on a government project for Spanish super-agents, culminating with the armored Guardia Civil. During the project, Diego conducted research into Spain's various costumed champions, including el Aguila. Diego discussed his findings with his younger cousin Alejandro Montoya. Having recently and secretly developed mutant powers (in his mid-teens according to the original OHotMU entry), Alejandro assumed the mantle of el Aguila, hoping to prove worthy of his ancestor Paco's great legacy. 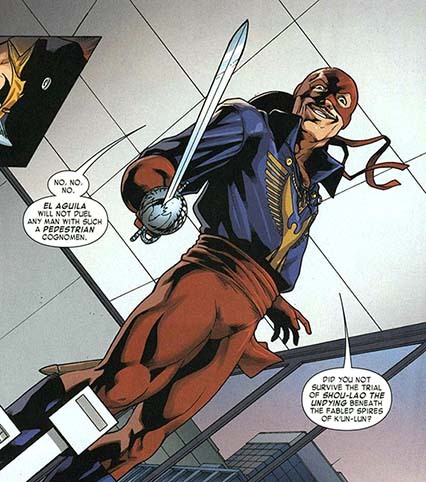 (Official Handbook of the Marvel Universe I#1: Aguila entry) - At some point, Alejandro Montoya trained in the art of swordsmanship. (Power Man & Iron Fist I#58 - BTS / Official Handbook of the Marvel Universe Deluxe Edition#1: Aguila entry) - In New York City, el Aguila became a champion of the poor, downtrodden and mistreated; he particularly preyed on drug dealers, slumlords, and those whose criminal activities most affected the poor. 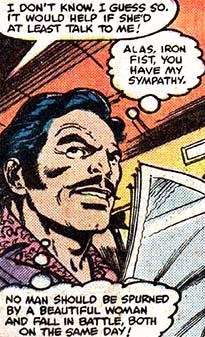 (Power Man & Iron Fist I#58 - BTS) - His Robin Hood style of chivalry made him a local hero of the impoverished, but soon caught the attention and annoyance of powerful factions, including the Lindon Street Property Owners' Association. (Power Man & Iron Fist II#2 (fb) - BTS) - Aguila fought the Commedia Dell'Morte to a standstill in the Alhambra fortress in the Spanish town of Granada. (Power Man & Iron Fist I#58) - During his regular raids of drug dealers and other ne'er-do-wells, Aguila ran across Power Man, Iron Fist, Misty Knight and Harmony Young who were at a Harlem nightclub where Aguila came to confront local dealer Mr. Hayes. The gang leader quickly dodged out of sight, leading Aguila to rob all the remaining mobsters and their entourage of their valuables. Hayes eventually tried to shoot Aguila, who was saved at the last moment by Luke Cage who caught the shot. Noting he owed Cage his life, Aguila regretfully blasted Cage to force him to drop the bag containing what he'd robbed off the criminals; Aguila then departed with the loot. (Power Man & Iron Fist I#58 - BTS) - Over the next several days, el Aguila made a name for himself by dealing with procurers, drug dealers and police officers who exceeded their bounds. Heroes for Hire Power Man and Iron Fist were contractually obligated by the Lindon Street Property Owners' Association to take down el Aguila, much to their chagrin. (Power Man & Iron Fist I#99 (fb) - BTS) - Despite the fact he was only trying to do good, Aguila's actions didn't make him too popular with the police. At least a dozen warrants for his arrest were issued. (Power Man & Iron Fist I#58) - Power Man and Iron Fist shadowed J.P. Preston figuring el Aguila would soon make his move against the banker. When he did, Aguila quickly took down the guards who rushed out to defend their boss, before moving on to Preston who was supposedly carrying a briefcase loaded with cash. Cage and Iron Fist intervened, with Daniel Rand dodging Aguila's blade long enough to knock him into submission. Preston and one of his henchmen then proceeded to pound on Aguila, which made the heroes for hire feel obliged to intervene. As soon as they did, Aguila managed to get away with the money, realizing he was in his new amigos' debt. (Power Man & Iron Fist I#64 - BTS / Power Man & Iron Fist I#65 (fb)) - El Aguila, though troubled by the notion, figured he had to act against Power Man and Iron Fist after observing how they walked into a den of thieves and murderers unmolested. However, he didn't stick around long enough to realize Luke and Danny actually went in to take them out. (Power Man & Iron Fist I#65) - El Aguila broke into the Heroes For Hire offices, accessing personal files in an attempt to gain as much intelligence as possible about his new foes. Learning of their latest mission to the Canadian Rockies, Aguila decided to shadow them in his civilian guise. While the heroes made their way to the Aerie, Jeryn Hogarth's home, Aguila followed by flying his helicopter and shooting his bio-blasts at anyone foolish enough to remain outside. Power Man rushed out to fight him, but was covered by an avalanche caused by one of Aguila's blasts. The mercenary then made his way inside, forcing Iron Fist to deal with him. Daniel managed to disarm Montoya, but was surprised when his opponent fired an electrical blast from a grappling hook; still believing Aguila didn't have any super powers, Iron Fist assumed he had a second blaster built into the hook. As Iron Fist dodged, Montoya regained his sword, and pursued Jeryn Hogarth who he deemed responsible of evil and corruption; Aguila announced he would take Hogarth back to the US where he would be tried for his "many heinous crimes." As soon as he heard those allegations, Hogarth quickly composed himself and announced his innocence, but also agreed to accompany Aguila back to the US if it would straighten matters out; just then, however, a member of Jeryn's staff reported that half the staff was running amok, attacking the rest of them and looting the facility. This made Aguila realize the true culprits were in fact Jeryn's Aerie staff; feeling his rash actions had precipitated a crisis, Aguila proceeded to begin taking out the corrupt staff members. After Aguila explained his powers -- which he had exhausted -- to Iron Fist, the two joined forces. In the end, both Luke Cage and Daniel Rand helped Montoya -- who regenerated some energy in the course of the struggle -- to accomplish his mission; it was actually Jeryn's secretary, Jennie Royce, who took out the final rebel that had been holding Jeryn hostage. Jeryn Hogarth was so impressed he even asked Aguila to join Heroes for Hire, but Aguila refused because he didn't feel comfortable becoming part of an agency that was willing to work for anyone who met their price. While he bid the heroes adieu, he passionately kissed Jennie Royce goodbye before boarding the commandeered helicopter and flying off to parts unknown. (Power Man & Iron Fist I#78 (fb) - BTS) - El Aguila remained active in New York City, becoming aware of a murderous fiend known only as "the Slasher" (a disguised Sabretooth struggling to keep his bloodlust in check, despite his partner the Constrictor's best efforts). While on patrol, he became aware of the Slasher's latest victim, Margaret Dougherty, who actually managed to escaped the crazed villain despite her injuries. While Aguila briefly left to call the emergency services, Margaret was ambushed by a local street gang. (Power Man & Iron Fist I#78) - Aguila watched from the shadows as Power Man and Iron Fist arrived to take the gang down. After they took care of the petty criminals, Aguila revealed himself by firing a signature bio-electric blast from his blade. He explained his presence and the involvement of the Slasher, a fact that was corroborated by Dougherty. Aguila joined Danny and Luke in their search for the mysterious Slasher. Misty Knight and Colleen Wing agreed to go undercover as streetwalkers on 42nd Street in an attempt to lure the villain out into the open. Aguila watched them from a nearby rooftop, using a walkie-talkie to stay in touch with the Heroes for Hire. (Power Man & Iron Fist I#78 - BTS) - The Constrictor (Frank Schlichting) returned to the safehouse with food for Sabretooth only to realize the feral mutant had once again succumbed to his desire to kill. He rushed out to find him, even as Sabretooth briefly besieged Colleen Wing before he was chased off. Not too long after that, Sabretooth attacked a random man, which alerted Misty Knight. (Power Man & Iron Fist I#78) - El Aguila noticed the scuffle between Misty and the Slasher that was interrupted by the arrival of the Constrictor in his civilian guise. Deciding he needed to intervene, Aguila shot the Slasher with one of his bio-electric blade blasts and rushed to street level. There, he faced the Constrictor who laughed off the effect of Aguila's powers. Schlichting then fired Misty's gun at the hero who was able to dodge the bullets, amazed to encounter someone who was immune to his blasts. Misty and Aguila fought on, but were about to fall before the villains when Power Man and Iron Fist arrived to even the odds. Power Man used his bulletproof body to protect Aguila from all the gunfire. In the end, neither Aguila or the Heroes for Hire were able to prevent Constrictor from stealing a car to take the Slasher to safety. In the aftermath, Cage thanked Aguila for his assistance, telling him how glad he was to know whose side the vigilante was on. (Marvel Fanfare I#3 (fb) - BTS) - El Aguila learned that Cross Technological Enterprises (CTE) was developing a portable nucleonic radiator they were planning to sell to dictatorships around the world as a lethal means of crowd control. He decided to destroy both the prototype and the research stored at CTE's New York facility. (Marvel Fanfare I#3) - Unaware he was being monitored by surveillance cameras, el Aguila entered the CTE complex, only to be greeted by the company's head of security, Hawkeye (Clint Barton), who was initially friendly because he'd heard of the vigilante's recent encounter with Power Man and Iron Fist. However, Aguila was determined to continue his mission and, using his electromagnetic powers, dodged the archer's attacks. He led Hawkeye on a wild goose chase that eventually took them to the labs that contained all the research on the radiator. Aguila destroyed the data and the lab equipment before Hawkeye was able to ensnare him with a steel mesh net arrow. Energizing his blade, Aguila cut himself free and even shot a bolt at the surprised Hawkeye. He tried to convince Hawkeye that CTE was led by criminals, but eventually knocked himself out when his electrified blade hit the ceiling's sprinkler system, causing him to suffer a shock that stunned him. Just then, CTE's director, Ambrose Connors, arrived on the scene. Connors dragged the seemingly unconscious Aguila to a secret lab where the radiator was stored, explaining to Hawkeye that it was what the intruder was after. Aguila then quickly made him move, using his powers to set off all the metal arrowheads on Hawkeye's belt. Among the first pellets to explode were tear and sleep gas canisters, which caught both Hawkeye and Connors by surprise. Aguila used the distraction to free himself and to destroy the radiator, despite the archer's botched attempt to shoot him. As he left, Aguila told Hawkeye he felt the swashbuckler had the heart of a hero. (Power Man & Iron Fist I#99 (fb) - BTS) - Aguila became aware Rand-Meachum CEO Ward Meachum had started hiring a great number of criminals, convincing him he needed to investigate the situation. Aguila broke into the facility, only to be besieged by the security guards. (Power Man & Iron Fist I#99) - Aguila fought off the guards just as Colleen Wing and Misty Knight arrived to intervene. They helped him overcome the security forces, but Misty was taken captive. Wing and Aguila then decided to retreat to the Gem Theater to figure out their next move. There, they encountered Power Man, Iron Fist and NYPD lieutenant Rafael Scarfe who had joined forces with the heroes. Scarfe wasn't too pleased to see Aguila, seeing as there were over a dozen warrants out for him. Scarfe even warned the Heroes for Hire that they were in big trouble if they had been accessories to his crimes. El Aguila defused the situation by pointing out that Scarfe was free to chase him, but by doing so would only delay rescuing Misty Knight. Moments after Colleen had explained the situation, Fera burst in through a window, announcing she was pleased to find her enemy Iron Fist alive so she could kill him after she had retrieved the right video (as Shades & Comanche had accidentally stolen the wrong tape). Though she fought the heroes to a standstill, Fera soon realized they outnumbered her and left, dodging the bullets Scarfe fired after her. In the aftermath, Cage found the video Fera had been looking for. After playing it, the heroes and Scarfe learned of Ward Meachum's involvement with their enemies. Iron Fist and the others vowed to storm the Rand-Meachum Corporation and free Misty. (Power Man & Iron Fist#100 - BTS) - Master Khan (secretly Ward Meachum's ally all along) used the Power Gem of Quan to steal the "heart of Shao-Lao" (presumably an alternate spelling of Shou-Lao) from Iron Fist, rendering Danny Rand increasingly enfeebled and without a soul just as he was preparing to rescue Misty Knight. (Power Man & Iron Fist I#100) - El Aguila, determined to help save Misty Knight, joined Bob Diamond, Colleen Wing, lieutenant Scarfe, Power Man and Iron Fist at the Gem Theater on 42nd Street to discuss the rescue plan. 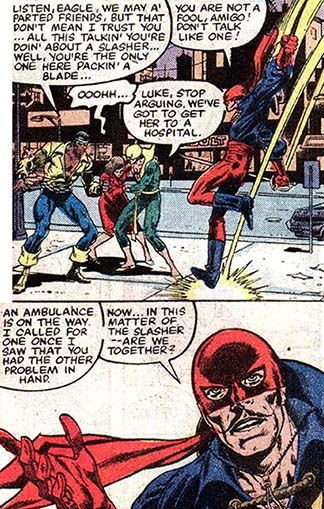 Iron Fist, weakened and having to rely on a wheelchair, still insisted on joining them. Arriving at Rand-Meachum, Aguila, Scarfe and Power Man mounted a frontal assault on the building's heavily armed security forces. (Power Man & Iron Fist I#100 - BTS) - While Aguila, Scarfe and Cage fought the bulk of the enemy forces, Misty Knight freed herself and D.W Griffith, who immediately retrieved his camera and began taping the fight from a safe location. Cage eventually beat Comanche and Shades while Fera helped Iron Fist regain his soul by attacking Master Khan, who disappeared from the earthly plane as soon as Danny smashed the Power Gem of Quan. Free from Khan's rule after tearing the Amulet of Shirrair from his neck, Fera took her leave. Then, Power Man and Iron Fist reconnected to fight Master Khan, eventually defeating their immortal enemy. (Power Man & Iron Fist I#100) - In the aftermath, Aguila joined the Heroes for Hire and their allies for some celebratory pizza. (Marvel Comics Presents I#9 (fb) - BTS) - Aguila's hometown of San Elaiyna was being terrorized. Figuring her highly successful American cousin Alejandro might be able to deal with the bullies, his cousin Migdalia contacted Montoya, unaware of his dual identity. Alejandro agreed to help out and traveled to Spain. (Marvel Comics Presents I#9/4) - Montoya traveled to the village, defeated three of the Conquistador's agents, and sent them to warn him to leave San Elaiyna alone. The mutant mob boss Conquistador (Provenza) took offense to the insulting nature of Aguila's warning and traveled to San Elaiyna to confront him in person. 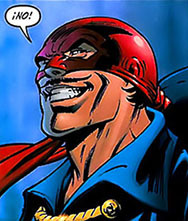 Aguila was initially caught off guard by the powerful mutant, especially since his cousin had failed to mention that Provenza had superhuman abilities. El Aguila recovered and channeled a bio-electric blast through a windmill into Provenza. This severed his enemy's link with the Earth, returning him to his true form as he lost consciousness. (Power Man & Iron Fist II#2 (fb) - BTS) - Aguila, along with Crime-Buster, Professor Gamble and several other vigilantes, were approached by Penance Corp founder Muhammed Zebari. Hoping that having some costumed heroes on the board of directors of his new private prison company, Zebari offered them all positions. Aguila and the others accepted. (Power Man & Iron Fist II#1 - BTS) - Aguila posed for a picture with Gamble, Crime-Buster and the others while touring one of the facilities run by Penance Corp (see comments). (Power Man & Iron Fist II#2 (fb) - BTS) - Even after Zebari was killed by Divine Right's leader Gerry Kammill, Aguila stayed on as a board member. He worked with the company's new CEO Joseph Duffy, unaware the man was actually a disguised Kammill. (G.L.A. I#2 (fb) ) - El Aguila, a broad smirk planted on his face, rejected the GLA's offer to join their team. (House of M#8 - BTS) - Aguila was one of the victims of the Scarlet Witch's reality altering spell that reduced the millions of gene active mutants to a few hundred worldwide. (New Avengers I#17 - BTS) - Aguila's mutant energies became part of the Collective. (New Avengers I#18 - BTS) - SHIELD analyzed the Collective's multiple energy signatures and traced them back to Aguila and 50+ other former mutants who had all lost their powers on M-Day. (Civil War: Battle Damage Report I#1: Civil War Files Appendix) - Despite the fact he'd lost his powers, Tony Stark still considered El Aguila as a potential Initiative recruit. (Power Man & Iron Fist II#2 (fb) ) - Even without mutant powers Montoya remained active as el Aguila, though he preferred to stay in shape by sparring with trainers in the gym rather than fighting genuine super-villains. (Power Man & Iron Fist II#2 (fb) - BTS) - Following Crime-Buster's murder, Aguila, Joe Duffy and the other Penance Corp board members had a meeting on a possible replacement for the deceased vigilante that lasted into the wee hours of the morning. (Power Man & Iron Fist II#2) - Aguila was in the Penance Corp executive suites when Joe Duffy brought up Daniel Rand, who had come to investigate the mysteries surrounding Crime-Buster's death. Instantly recognizing Rand as Iron Fist, the two heroes had a brief, playful tussle as a means of catching up. 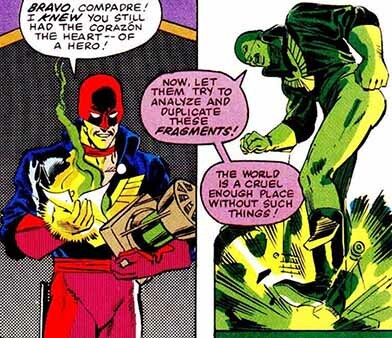 Aguila convinced Iron Fist he had nothing to do with either Crime Buster's death, let alone the Commedia Dell'Morte that seemed to be involved in the case. Y'know, for a character that's been around since 1979, Aguila has a very modest track record to say the least. A bit of a shame, seeing as he had the potential to become a popular street level hero. Having him be a mutant who was actually beloved would have made for some interesting stories. Heck, the original OHotMU writers certainly seemed fond of Aguila, seeing as the man has almost as many handbook entries as actual appearances. Now, my Spanish is un poco rusty, but the Spanish word for 'eagle' is 'Aquila', rather than Aguila. Aquila is Latin for Eagle, certainly. I think Aguila is indeed Spanish for Eagle, though; maybe the spelling varies b/t Mexican Spanish and Spain's Spanish? Thanks to Kevin Garcia, whose research supports this. Also noteworthy is that the accent is present over the A in Aguila in his first appearance, but I don't recall seeing it used elsewhere....anyone want to check his other early appearances and see if it was consistently used? Despite the fact he wasn't directly involved in his origin issue, the letters page of Power Man & Iron Fist I#61 credits penciller Dave Cockrum with designing El Aguila's costume... Which, with all due respect to the late great creator, looks like Thunderbird decided to go as Zorro on Halloween. The original and Deluxe OHotMU noted that Aguila was "currently on extended visa in US in his civilian identity." However, the Master Edition noted that he was a "presumed naturalized citizen of the USA"
The Master Edition entry on Aguila also notes that he could discharge a maximum of 10,000 volts (whereas the previous entries stated he could release 100,000 volts). Yours truly almost had an aneurysm trying to determine who the other costumed vigilantes were that made up the Penance Corp board. In the end, it was Power Man & Iron Fist writer Fred van Lente who provided the answers when he was kind enough to send part of the original script to help identify the "mystery members": Black Tiger, the original Thunderbolt and Professor Gamble. Much appreciated! 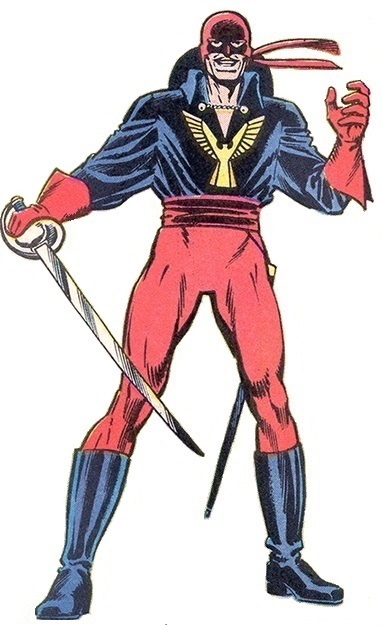 El Aguila received profiles in Official Handbook of the Marvel Universe I#1, Official Handbook of the Marvel Universe II (Deluxe Edition) #1, and Official Handbook of the Marvel Universe Master Edition I#12; he was also mentioned as a potential recruit in Civil War: Battle Damage Report I#1. His ancestor Paco was profiled in Marvel Westerns Outlaw Files I#1 (2006).